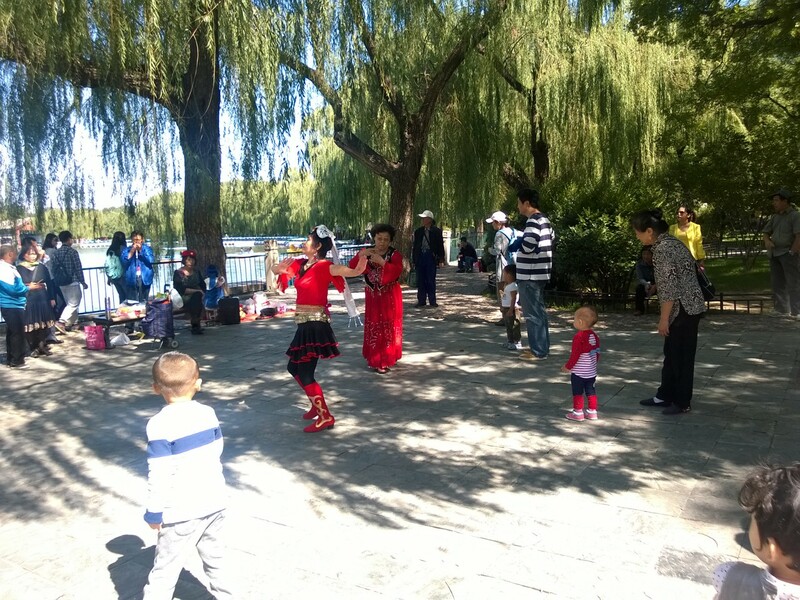 After wandering through a hutong by the Forbidden City and stumbling into Beihai Park by accident last year, I have always wanted to go back and experience this beautiful park again. Locals dancing, boats gliding around the lake and singers entertaining the local crowd plus beautiful temples make this an enchanting place. Now that we are on the Farewell Tour and enjoying our last visit to Beijing, it became more urgent to make it happen. So on our last day in town and with the heavy pollution clearing and the sun shining, we were able to explore again the most beautiful place in Beijing. Patti & I hanging on for dear life–no life preservers provided. Going in a new entrance this time, we immediately saw the Duck Boats, still available for rent due to being early in the day. Off we went! Sign a release of liability? NOPE!! Instructions on how to steer or safety instructions? HELL NO!! Life preservers or any type of flotation device to save our sorry asses if we have an accident? ARE YOU F&%KING KIDDING? This is China and, as with anything in China, you are on your own so you better pray you don’t get hurt. 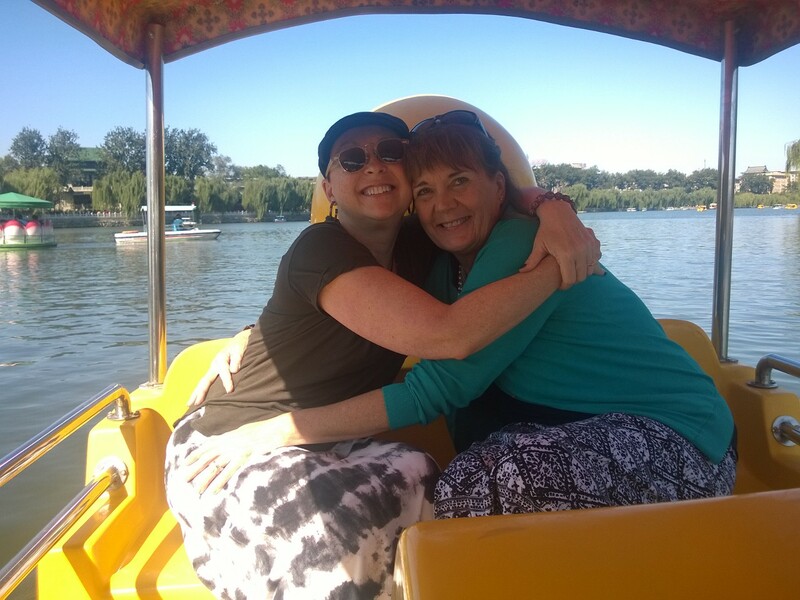 Thom and Larry started us off in charge with Patti and I enjoying the lake views and variety of boats–dragon boats for the many, little wood electric boats, round tulip-like boats and our Duck variety all raced around the lake. Occasionally we saw a speed boat cutting through the traffic to get across the lake and deliver some important person to their destination. The more money, the bigger and faster the boat. In China, it’s all about the status. I’m not sure what our Duck Boat says about our status but I’m betting no one was very impressed with us. Since I had just taught a class where the theme was, “Be The Duck!” (as in a duck is calm on the top of the water gliding gracefully while underneath the water (where no one can see) the duck is peddling fast and furiously), it was a foregone conclusion that we had to pick the Duck as our boat of choice. Needing some exercise, I took over the peddling and steering to take a tour of the lake. Crazy parents let their spoiled kids steer so it was like bumper boats with one family intentionally ramming us with their electric boat while we pedaled like maniacs to avoid them. BAM! Since they were aiming for us, there was no avoiding it so you might as well smile and hold on for your deal life. Luckily no damage and after lots of laughter on their part, we continued on our journey around the lake. After watching the ferries from our apartment window daily and how they turn and slam into the docks, I mimicked their moves as we approached the end of our journey. BAM! I’m such a local now. The attendant hooked us with his long pole to tether us to the dock and off we went to our next adventure in the park.